Over the past year and a half my diet has significantly evolved. I used to eat pretty much whatever I wanted (without corn and soy) but still had stomach issues. Then I dove into gluten-free eating and noticed that my issues had improved a bit, and when I started to eat more paleo/primal (with a few gluten-free things here and there) they all but disappeared. However over the past couple of months the train has fallen off the tracks, so I’m declaring a spring reset for the month of April. It started out innocent enough; a couple of extra glasses of wine here and there, stealing bites of the Englishman’s delicious yet gluten-filled bread, and not being as diligent at restaurants as I normally am. But that quickly turned into Sundays spent on the couch in agony with stomach pain and headaches, more breakouts and my digestion running amok. And look, I know we are all human and can’t be perfect all the time (cause where is the fun in that?) but I definitely realized I can’t be as liberal with my diet as I’d like, cause I just don’t feel great. So for the month of April, we’re (the Englishman is participating in this to some degree as well) going to clean it up a bit. Joelle recently wrote that she’s going to do a Whole 30, and I think we are going to do something along the lines of the 21 Day Sugar Detox with a few modifications that work for us. So what does that look like? Adios Gluten: I’m going to bid gluten adieu for the month of April and the Englishman is just going to stick to his homemade stuff (like his bread). Less Drinking: This one is pretty straightforward, and much friendlier on the wallet too. Sayonara Sugar: I have a habit of having something sweet after dinner every night, so I’m working to break that a bit. Natural sugars for the win! Getting Back on the Mat: I’ve finally found a yoga studio I love, and I’m going to aim to practice at least 1-2x a week. Focus on Getting Stronger: I’ve been battling a few injuries since my half marathon last fall, so I’m focusing on perfecting my crossfit technique, going for shorter runs and yoga. And for the record, I don’t think grains are the devil, nor do I believe that one “diet” works for everyone. I’m going of what has worked for ME in the past, and hopefully getting my digestive system back to normal. The Englishman and I are going to France in May, and the last thing I want on my trip is to be feeling crummy. Plus, I’m excited to try new recipes and I’ve already got some stuff bookmarked to share on the blog. So that’s my two cents on that. Anyone else up for a spring reset? Come join in the fun! I’ll be sharing on instagram and twitter with #springreset. 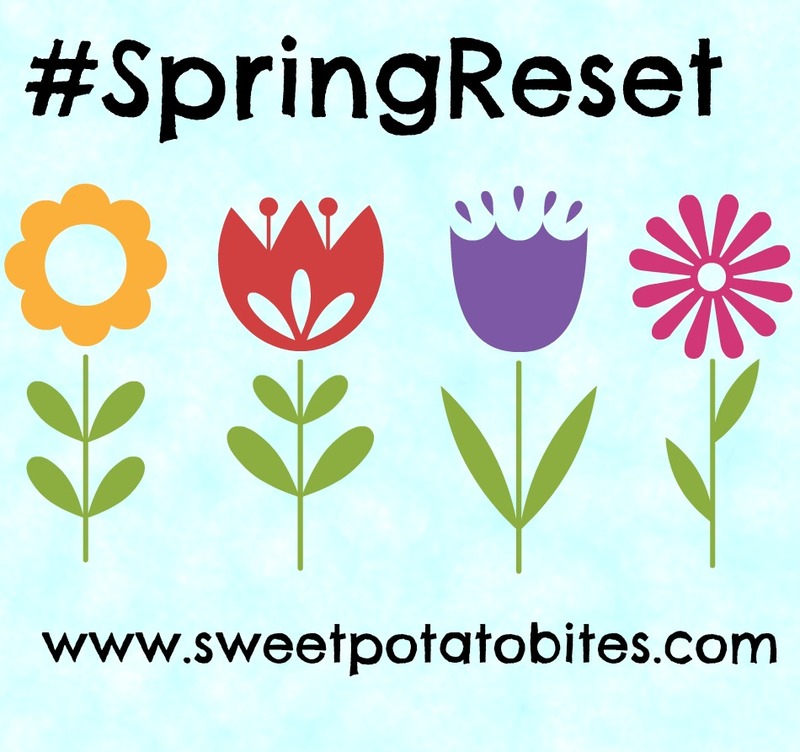 This entry was posted in Healthy, Life, Paleo and tagged challenges, spring on April 1, 2015 by allie@sweetpotatobites. YAY for resetting! We got this. Oh man I need this too. My stomach has been a mess for so long that I really think I need to try an elimination diet to figure out what affects me. I think it might be some sorts of preservatives that just destroy my stomach. All for reseting. I need to do it too! What a great idea! I’ve been considering putting my diet in check. I’ve been imbibing way too frequently, and paired with binge-eating whatever I want, I’ve been feeling less than stellar. Good for you, Allie!